Postcards are electric. I get excited just turning a rack of postcards around at the drugstore. There was a time before Facebook and Twitter and Instagram when we sent postcards to people. These were generally times of change and travel, new cities, new landscapes, new friends, new languages. The challenge of the postcard was to get all your news on the back where the space for composition was small. You had to condense. You had to take all the excitement of a moment of vision and squeeze it on the back of a card. The poems in this collection are just that: condensations of amazed observation. They have more to do with spirit than place. Subjects vary from baseball to summer rain, the orphans of Aleppo to the taste of honeyed tarragon on the tongue. Their brilliance comes from the region of the mind where there are no borders, a zone of uncharted existence where we are all immigrants. Maybe there are two kinds of poetic craft: one in which a poet steadily hones and polishes a draft until it shines, and one in which a poet sim-ply opens a channel between the self and what needs to be said. 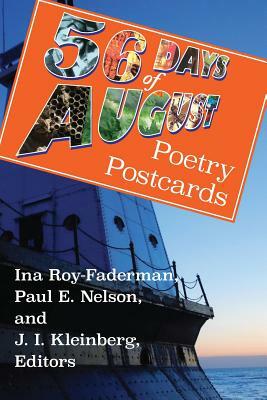 Paul E. Nelson's August Poetry Postcard Project is a powerful example of the second type. This anthology gathers a mailbag of short poems that all possess stunning immediacy, as well as several visual poems for the eye to wander into. A watermelon smile, Frank O'Hara jotting on a street corner, 'lips a-drip with deep fried meat' - the vibrant details have me spinning and spinning this postcard rack, fascinated by the insistent freshness of its offering.